Recap: Seventh grade is a tough time for most people. But it’s especially rough for Apron Bramhall. Her mother died of cancer. Her father is dating an awful woman. And to top it all off, her name is Apron and she has red hair and freckles. But then she learns her father is going to become a father again — this time with his girlfriend, who’s also the Brazilian nurse who used to care for her mom. At the same time, her best friend decides to become best friends with one of the coolest girls in the seventh grade. If she thought her world couldn’t get any worse, it did. But Jesus helps her get through it — KIDDING! Well, sort of. After seeing the musical Jesus Christ Superstar with a friend, she learns the actor who plays Jesus is related to one of her neighbors. Suddenly she’s seeing this Jesus person all the time, and he always seems to rescue her — like when she accidentally slaps her grandmother at her father’s wedding and later falls on the concrete outside. Soon this guy, whose real name is Mike, becomes one of her closest friends. He and his boyfriend, Chad, are florists and offer Apron a summer job. Spending time with them opens her eyes to a whole new world — a world of adults who have found true love, adults who make decisions and make them proudly, adults that show Apron the kind of person she wants to become. Analysis: Girl Unmoored is a coming-of-age story about a young teenager who truly has become unmoored. But man, is she strong. It’s that strength that allows her to make the most of her situation and grow up. It seems that everything in Apron’s life is falling apart, and becoming friends with Mike and Chad is an unexpected way to deal with it. After all, they are older than her; she’s never met any gay people before, and ultimately she learns that Chad has a devastating secret. Becoming friends with this couple is not what one would recommend for dealing with the death of a parent, the end of a friendship, and a pretty horrible stepmother. But they’re her lucky charms, and the reader starts to realize that on the inside, Apron is much older than 13. One of the best parts about this story is the way it’s told. Written in first person, each chapter acts as a bridge to the next. It never really feels like anything happens in each chapter individually. Then suddenly, you’re at the end of the novel and realized you’ve just read something great. The changes in Apron and the growth in her character are subtle, but they’re there. The book reads like a diary, and the development sneaks up on the reader. MVP: Apron. In a novel that starts off with such an empty girl, Apron is full by the end — full with friends, love, and excitement for the future, instead of dread. Get Girl Unmoored in paperback for $12.66. Or get it on your Kindle for $7.69. It seems like every year, more and more celebrities pen memoirs. Some of them we care about. A lot of them we don’t. But 2014 seems like it might be a good year for celebrity books! Good Morning America anchor Robin Roberts, comedian Martin Short, and Glee actress Lea Michele are all working on books to be released next year. According to The New York Times, Robin Roberts’ book will be a memoir detailing her struggles with cancer and recent bout with a rare blood disorder. Of course, it will also include the life lessons she’s learned along the way, much of which is owed to her successful career in the TV industry. Published by Grand Central Publishing, the as-yet untitled book has an April 2014 release date. According to The New York Times, Martin Short is also penning a memoir due to be released next Fall. His book will include details about his career in show business (including Saturday Night Live and The Three Amigos) as well as his 30-year marriage, which ended in 2010 when his wife passed away. Harper is publishing the funnyman’s book, which is not yet titled. Even 55 years later, men are still willing to pay a pretty penny to get their hands on Holly Golightly. According to Huffington Post, the original manuscript of Truman Capote’s famous Breakfast at Tiffany’s sold at auction for $306,000. Russian retail billionaire Igor Sosin bought it, with plans to display it in Moscow and Monaco, according to RR Auction. RR Auction is an Amherst-based auction house, which sold the manuscript online. Probably the most notable part of the manuscript, written in 1955, is Capote’s handwritten notes in the margins — including changing the main character’s name to Holly Golightly from Connie Gustafson. The manuscript was published in the 1950’s in Esquire magazine before being turned into the 1961 movie that made Audrey Hepburn a star. **Note: Spoilers of both the novel and the movie are included in this post, and this is a longer post than I normally blog, but considering the buzz around this movie, I thought it was warranted. If anyone who knows me were to tell you about me, I’m sure my obsession with The Great Gatsby would somehow make its way into the description. I’ve read the book ten times and can recite whole lines of it in my sleep. With its perfect mix of mystery, romance, and heartbreak, it is the great American novel. It captures the spirit of the 1920s in all of its liquor-fueled, Charleston-dancing glory. The book’s themes of unattainable love, longing for the past, and wealth acting as both a facade and a security blanket aren’t specific to the 1920s. In short, the story of Jay Gatsby is timeless and relatable. I have been against the movie ever since I saw the first trailer last year. So, naturally, I saw it on opening day. The movie certainly encapsulated what made the 1920s “roaring”: loud parties, extravagant outfits, fast cars, over-the-top fits of drunken joy and rage. Having seen Moulin Rouge! and Romeo + Juliet, I knew Baz Luhrmann would at least be able to nail the parties at Gatsby’s–and did he ever. The parties are larger than life and successfully translate Fitzgerald’s words into a visual spectacle of booze, sequins, and confetti (and in 3D, it’s almost like you’re there). But the 3D doesn’t translate well to the other parts of the movie. It just adds unnecessary flashiness. In the movie, When Nick gets drunk at Myrtle and Tom’s apartment, he is also drugged by Myrtle’s sister. This doesn’t happen in the book, and leaves him and the viewer feeling lost, confused, and perhaps a little nauseated. What is a Baz Luhrmann movie if someone isn’t hallucinating on drugs? Despite the glamor of the party scenes, the majority of the movie was dizzying, choreographed, and highly impersonal. I felt nothing for anyone. The characters in the movie seemed like bad caricatures of the ones in the book. Jordan Baker might as well not even have existed in the movie, as there is never a relationship between her and Nick and she is used only to supply us with the narrative of Gatsby’s life. Jason Clarke as George Wilson was excellent at being pathetic, giving off the perfect forgettable vibe that is so essential to George’s existence in the book. Nick’s recovering-alcoholic-writing-in-recovery seemed lazy when I first heard about it, but it works for why Nick (who, in the book, is simply considered a “bond man”) is writing the book in the first place. But generally, Nick and the rest of the gang are empty and uninteresting. The only exception is Leonardo DiCaprio as the ever hopeful, sometimes vulnerable Jay Gatsby. Unfortunately, his character isn’t fleshed out as much as he could’ve been, and no one shows up to his funeral. In the book, his father comes and gives Nick some insight into the real James Gatz, something the movie would’ve benefited from. The book was quoted extensively, but often times quotes were cut short and replaced with watered-down translations of the actual lines, as if the screenwriter assumed the audience would be too dumb to understand what the character was saying. The best use of quotes from the book is in the movie’s climax (and possibly best scene), when Gatsby, Nick, Jordan, and the Buchanans go to the Plaza Hotel and Gatsby desperately tries to get Daisy to leave Tom. The interactions between Daisy, Tom, and Gatsby are believable, tense, and awkward–everything Fitzgerald intended for it to be. The scene is almost word for word what is written in the book, with one dramatic exception. At one point, Tom points out Gatsby’s facade and predicts that he will be unable to care for Daisy if his whole life has been a lie, which Gatsby responds to by destroying the bar, grabbing Tom by the collar, and screaming in his face. After this violent outburst, Daisy changes her mind and seems afraid of him. This never happens in the book, and is almost insulting to people familiar with it. In the novel, Daisy changes her mind because she is comfortable with Tom. She is accustomed to domestic violence (frequently calling her husband a “hulking brute” and pointing out bruises on her hand caused by Tom), so it is unrealistic to think that Gatsby yelling in Tom’s face would be the catalyst for her refusal to leave him. She knew she’d never leave Tom from the moment Tom pointed out how Gatsby made his money. Tom’s money is inherited; Gatsby’s money is earned through questionable practices. A recurring topic of discussion in the book is the issue of bad drivers (at Gatsby’s parties, Jordan’s attitude about bad drivers, and Daisy’s reckless behavior behind the wheel, to name a few), yet this is never mentioned in the movie. It is glossed over with the actual scenes of accidents, Gatsby swerving around other drivers, and the drivers of any automobile rarely looking at the road in front of them. The metaphor about bad drivers and people who are careless about others’ emotions (namely Tom, Daisy, and Jordan) is an important realization Nick makes in the course of the novel, but one that is lost in all of the swirling cinematography. My final gripe with the movie is the soundtrack. The soundtrack is great, but do we really need to hear every song played in the background of every scene? And how many times (and in how many renditions) do I have to hear “Young and Beautiful” by Lana Del Rey to get the point they’re trying to make about exterior beauty and shallowness? And was anyone in 1922 driving into NYC blasting “Izzo” by Jay-Z? I understand the need to want to make this “modern”, but it is unnecessary. The themes of the story are timeless, and Jay-Z doesn’t have to be used to reach an audience in 2013. I think Fitzgerald did that well enough on his own when he put pen to paper in 1922. The movie is chock full of visual excitement, but very little else. When reading the book, whole lines of text can jump out for being poignant, meaningful, and beautifully written. At the end of the movie, lines literally jump out at you in 3D cheesiness. 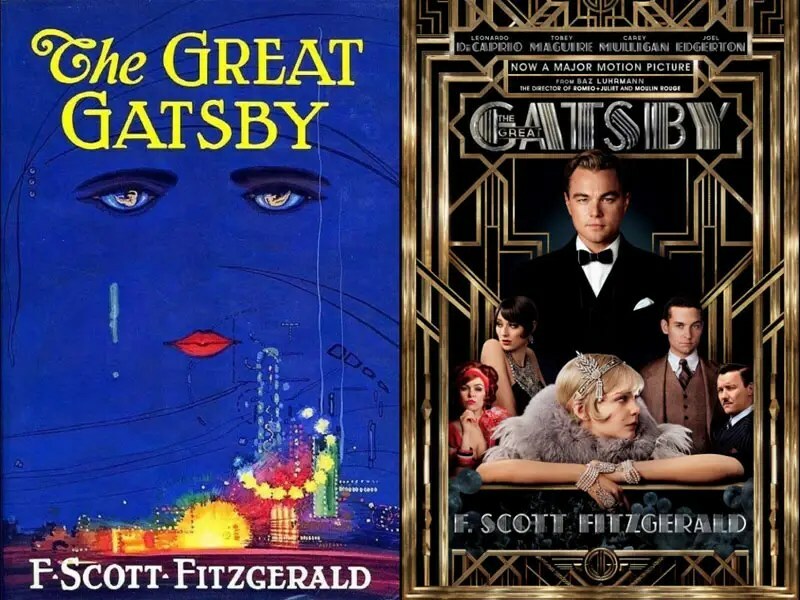 The book deserves the title The Great Gatsby because Fitzgerald didn’t have to beat anyone over the head with meaning or water-down his words with easy-to-understand replacements. I hate to say that I actually found myself bored a few times. The movie title might’ve been more accurate if it were The Flashy, Leo-Driven Gatsby or The Okay Gatsby. Final say: The Great Gatsby will never be a good movie. This was a decent effort, but it fell flat in many places. As an English teacher, I’d prefer it if Baz Luhrmann left literature alone and let good writing speak for itself. Watch the The Great Gatsby trailer here. With all the good world-renowned primatologist Jane Goodall has done, she is now experiencing some mishaps. The scientist, best known for her work and research with chimpanzees, is now accused of plagiarism in her new book, forcing her publisher Grand Central to delay its release. According to The L.A. Times, the book, Seeds of Hope, is a tree and plant focused book, meant to share Goodall’s love of plants, even though she’s never studied them as a scientist. It’s apparently in the sections about plants that certain passages appear to have been “borrowed.” Allegedly, at least 12 passages in the book are borrowed from places like Wikipedia, a web site called Choice Organic Teas, and several other web sites. My goal is to ensure that when this book is released it is not only up to the highest of standards, but also that the focus be on the crucial messages it conveys. It is my hope that then the meaningful conversation can resume about the harm we are inflicting on our natural environment and how we can all act together to ensure our children and grandchildren inherit a healthy planet. Does anyone else think this tarnishes Jane Goodall’s work? Or has she already made such a name for herself that it doesn’t affect her career at this point?